Mass mutations of insects at the Jurassic/Cretaceous boundary? Abstract: Dating of detrital white mica taken from the Carboniferous-Permian sediments of the Western Carpathians provided powerful results for determination of source areas. Two groups of samples were studied, first from the Carboniferous formations of the Northern Gemeric Unit and second from the Pennsylvanian-Permian sequence of the Hronic Unit. Both units are extremely important for the geodynamic reconstruction of the Western Carpathian Variscan Orogen, as the Northern Gemeric Late Paleozoic reflects the development of a Variscan collision suture and the sedimentary history of Hronicum formations allows reconstruction of the timing of rifting processes in the hinterland. Rift-related sediments of the Hronic Unit show a trend of increasingly older detrital mica in an upward direction. Three samples from the Nizna Boca Formation, belonging to Kasimovian–Gzhelian (Stephanian B-C), were investigated from the Hronic Unit. The stratigraphically lowest sample yielded an age of 309±3 Ma. The samples from the middle and upper portion of the Nizna Boca Formation delivered successively older ages of 318±2 Ma and 329±2 Ma respectively. The time gap between the average cooling in the source region and the age of sedimentation in the basal part of the Nizna Boca Formation does not exceed 5 Myr, whereas at the top of the same formation this time difference reaches about 20 Myr. The trend to older ages in higher stratigraphic levels in this tectonic unit is further corroborated by a sample derived from the Permian Maluzina Formation, 2nd megacycle, which yielded a still older age of 342±3 Ma. These cooling ages of the source area reflect development of the Hronicum terrestrial rift and heterogeneity of the source area, with gradual rifting and cooling of the lithosphere. Four samples from the Northern Gemeric Unit were also investigated. A multi-grain sample from the Mississippian Hradok Formation yielded a 465±2.5 Ma cooling age of the source area. This proves the existence of Ordovician crustal fragments in the Variscan collision suture. Newly-formed fine-grained muscovite gave a distinct staircase pattern from 87 Ma at the rim to 142 Ma in the core. It reflects composite Alpine overprint of these metasediments. Multi-grain analyses of detrital mica from the Moscovian (Westphalian) Rudnany Formation sandstone and from an orthogneiss pebble from the associated conglomerate yielded ages of 385±3 Ma and 372±2.5 Ma, which reflect a uniform Variscan source. Abstract: Diverse fossil insect assemblages near the Jurassic/Cretaceous transition from the Shar-Teg in Mongolia comprise frequent deformed species. These (first known) mass fossil animal deformities, expressed as fusions of veins changing the wing geometry, probably represent heritable mutations. They accumulated as a result of a changed structure of selective pressure, and are unique in showing how individual variations may be fixed to form higher taxa, significantly contributing to the process of evolution. Similar deformities were also recorded in recent ecosystems undergoing elevated environmental stress. The occurrence of deformities indicate a long-lasting (100 kyr–1 Myr) ecological stress in the continental environment before the J/K boundary and a biotic character of the changes: high evolutionary tempo and consequent radiation of newly evolved taxa forming new control mechanisms including social decompositors and new predators, resulted in temporary more or less destabilized ecosystems and uncontrolled, rapid evolution of its elements. Accordingly, ecosystems with higher diversity stabilized and some of their elements remained virtually unchanged for over 30-million-years at least in Laurasia. Notably, occurrences of true flowering plants and some advanced insects during the lowermost Cretaceous are limited to the region. Abstract: A single turbiditic coarse limestone layer (thickness up to 10 cm), interpreted as distal calciturbidite, is described for the first time from the Lower Cretaceous Schrambach Formation of the Lunz Nappe (Kaltenleutgeben section, Northern Calcareous Alps). It is composed almost exclusively of bioclasts derived from echinoids (about 50 %), bryozoans, coralline red algae, foraminifers, and remains of stromatoporoids and belemnoids; calcareous green algae are missing. The stratigraphic age of this layer is Late Hauterivian based on the findings of the Euptychoceras Abundance Zone. The biota, indicate a source area in an upper slope position marking the transition to shallow-water areas. This is the first record of a shallow-water evolution in the Northern Calcareous Alps from the time-interval between the Barmstein limestones (Late Tithonian–Late Berriasian), the Plassen Formation (up to Early/Middle Berriasian) and the allochthonous Urgonian limestones (since Late Barremian onwards). A relationship to equivalent biodetritus within the Rossfeld Formation, which currently lacks biostratigraphic data, is possible. Finally, transportation from southern directions is assumed due to the occasional occurrence of chrome spinel and the nappe tectonic position of the locality. Abstract: Th-U-Pb dating of monazite confirms the Permian age 278±11 Ma of rhyolite tuff in the Northern Gemericum. This rock was a protolith for stratiform U-Mo mineralization formed during the Late Permian by ground water. The Permian formations and stratiform mineralization are cut by younger vein and stockwork mineralization near Novoveska Huta and Krompachy. The quartz vein with uranium mineralization in Krompachy is accompanied by albite, rutile, sulphides, xenotime-(Y) and rare monazite-(Ce). Th-U-Pb dating of the vein monazite gives the Cretaceous age 124±10 Ma of remobilized vein uranium mineralization. Abstract: The NW Peloponnese (Greece) belongs to the west-verging Alpine thrust-fault belt. Deep-water sedimentation ensued, in the Gavrovo-Tripolitza and Ionian foreland basins, as relief was being built-up and the Tertiary compression migrated westwards. The deep-water sedimentation and the deep structure of the thrust-fault belt are hereby assessed on the basis of interpreted seismic profiles, borehole and field data. The sedimentation is controlled by sea-level changes and thrust activity. The highest sedimentation rates for the Gavrovo-Tripolitza and Ionian Zones are observed during the Early Oligocene. In the Late Eocene, within the Gavrovo-Tripolitza Basin, middle to outer fan associations prevailed (Drossia-Charavghi Formation) changing to a channeled sea floor (Roupakia Formation) as the Pindos thrust front approached. A deceleration of the Pindos’ advancement, combined with sea deepening, changed the environment to distal fan and hemi pelagic (lower Skouras Formation). On top of the Skouras Formation a regressive episode is marked. In Late Eocene, clastic sedimentation was installed in the Ionian Basin. First, distal fan facies overwhelmed the Ionian carbonate sedimentation (Mavri Miti Formation). In the Early Oligocene the Santameri Formation witnesses basin stability with distal characteristics in its lower parts. The lower Peta Formation, during the Late Oligocene is similar to the previous one. A rapid and important uplift of the Pindos hinterland is marked in Peta’s upper members. Abstract: New biostratigraphic, petrographic and sedimentological investigations on Saf Lahmame marly-arenaceous succession of the External Tanger Unit (Intra-Rif sub-Domain, External Domain) indicate an age not older than Burdigalian–Serravallian. The medium- to fine-grained sandstones of the Saf Lahmame succession show mainly graded and massive amalgamated beds organized in thinning- and fining-upward sequences. Medium-grained deposits reflect a continual process of aggradation beneath a high-density turbidity current and by a very quick deposition for freezing of a dense cohesionless suspension under a highly concentrated flow. A fine-grained facies association reflects slow accumulation of mud and biogenic materials and diluted and low concentration turbidity currents. The sandstones of the sublitharenite/quartzarenite groups are characterized by common occurrence of glauconite grains. Their provenance seems to be exclusively related to the African Craton, which is in good agreement with the published data on the composition of the Numidian and Numidian-like sequences in the Rif, Betic and Apenninic-Maghrebian Chains. The SE and NW paleoflows within these sandstones could reflect a multisource alimentation from instable marginal areas of the Africa. Abstract: Mineralogical studies (XRD, SEM, EDS) and geochemical analysis (XRF) were applied to samples of the Neogene Çaybağı Formation representing different facies of lacustrine and fluvial lithologies. The bulk mineralogy of the fluvial and lacustrine deposits comprises carbonate minerals (calcite, dolomite, aragonite), clay minerals (smectite, illite, chlorite, mixed-layer clays S-C), nonclay silica minerals (quartz, feldspars, opal, cristobalite) and gypsum and anhydrite. The smectite, calcite, dolomite and gypsum are generally authigenic. The quartz, feldspar, illite, chlorite, detrital smectite probably derived from basement rocks. Major oxides and trace elements (SiO2, TiO2, Al2O3, Fe2O3, Cr, Ni, Co, Cu) are present in high amounts in the fluvial formations and the marginal lacustrine facies, and these are constituents of detritics transformed from the surrounding basement. The central facies of the lacustrine formations are rich in Pb, Ba, Rb, Sr, CaO and K2O and composed of authigenic limestone, dolomite, gypsum, anhydrite and smectite. The authigenic minerals are probably derivatives of the solutions solved from clastics and ash fall and moved towards the central zones of the lake increasing pH, Mg/Ca ratios and thus leading to the precipitation of the carbonate. 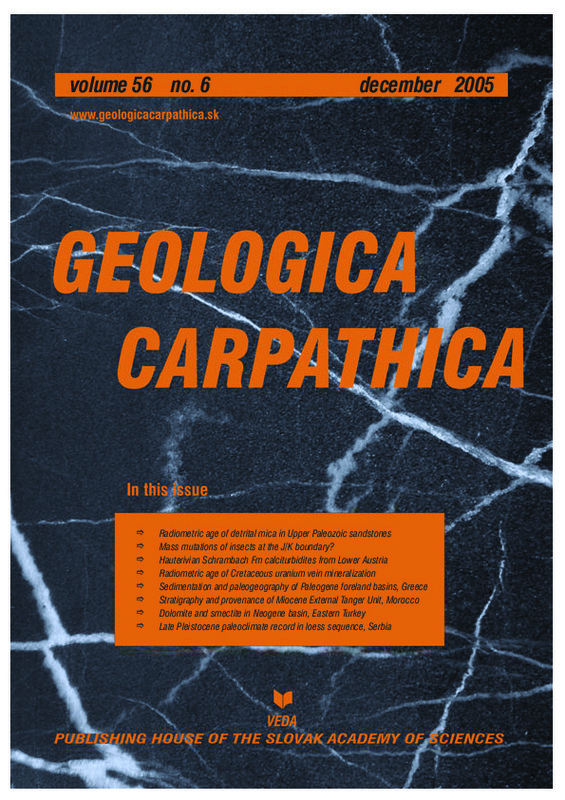 The high Ba/Sr and Rb/Sr ratios in marginal lake facies are related to the presence of small amounts of carbonates, which incorporated Sr.
Abstract: Four loess units and three paleopedological layers are preserved in the ~8 m thick Petrovaradin exposure, Vojvodina, Serbia. Amino acid geochronology provides stratigraphic correlations between loess units L1 and L2 at Petrovaradin with loess of glacial cycles B and C, respectively, at other Central European localities. Magnetic susceptibility and sedimentological evidence of the Petrovaradin loess-paleosol sequence are used for correlation with the SPECMAP paleoclimatic record. Late Pleistocene climate dynamics recorded in the Petrovaradin brickyard loess-paleosol sequence present temperate humid and warm interglacial and temperate cold glacial climatic conditions. The last glacial paleoclimatic record provides two main cold and dry stadial periods corresponding to deposition of two loess layers L1L1 and L1L2, as well as one moderate cold and relatively dry interstadial. Many episodes of alternating cold-dry and warm-wet paleoclimatic conditions suggest a possible correlation with abrupt paleoclimatic fluctuations recorded in the North Atlantic region. The results of malacological investigations of the Petrovaradin site demonstrate significant similarities to the Paleopreillyrian fauna of the southern Transdanubia region in Hungary, which suggests that the Petrovaradin site has a refugial character during the periods of dust accumulation.